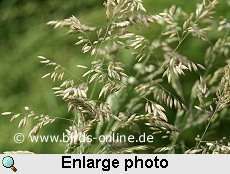 In Central Europe, velvet grass (Holcus lanatus) flowers from June to August. Ripe seeds of this plant can be found in nature from July to September. Some spears grow up to a length of one meter. 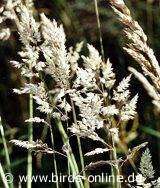 Velvet grass can be recognized by its delicate ears that are coloured white with a slight touch of violet. There are tiny hairs on the leaves of the velvet grass. 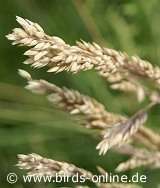 Most pet birds prefer flowering or half-ripe velvet grass as their food, but some birds also like to eat the ripe seeds of this grass species.